One of the best things about summer vacation is that I get to read to my heart’s content. Stay up late? No problem. I can sleep in or nap the next day. All semester long, I accumulated this fabulous TBR pile that, because of work and revisions, I couldn’t get to, but oh how I wanted to. 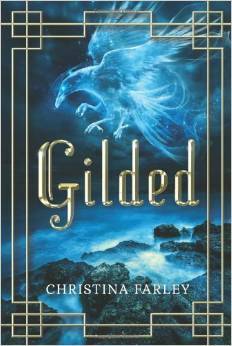 I broke my reading fast with GILDED by Christina Farley. I met Christina at the 2013 SCBWI Florida Mid-Year Workshops. Actually, it was during the Elixir Mixer, where my friend Larissa introduced us. We got to talking about multicultural books and myths and the richness of other cultures when she told me about her debut novel, GILDED, a YA contemporary fantasy which features Korean mythology. She gave me her card, and I immediately started following her on Twitter. When her book released on March 1, I cursed I couldn’t read it immediately. When I finally did in early May, though, I was not disappointed! Sixteen-year-old JaeHwa Lee is a Korean-American girl with a black belt, a deadly proclivity with steel-tipped arrows, and a chip on her shoulder the size of Korea itself. When her widowed dad uproots her to Seoul from her home in L.A., Jae thinks her biggest challenges will be fitting into a new school and dealing with her dismissive Korean grandfather. Then she discovers that a Koreandemi-god,Haemosu, has been stealing the soul of the oldest daughter of each generation in her family for centuries. And she’s next. But that’s not Jae’s only problem.There’s also Marc. Irresistible and charming, Marc threatens to break the barriers around Jae’s heart. As the two grow closer, Jae must decide if she can trust him. But Marc has a secret of his own—one that could help Jae overturn the curse on her family for good. It turns out that Jae’s been wrong about a lot of things: her grandfather is her greatest ally, even the tough girl can fall in love, and Korea might just be the home she’s always been looking for. What I liked best of this novel is how Christina seamlessly weaves South Korean mythology with a fast-paced plot filled with tons of action. I couldn’t stop turning the pages and read the book in practically one sitting. We get some wonderful city views of South Korea and feel the energy of the setting. Just as impressive is the world of the demi-gods. As far as characters, Jae Hwa Lee is a strong, likable protagonist who finds herself face-to-face with the things legends are made of–and she kicks demi-god booty in the process.I can’t wait for SILVERN, the sequel to GILDED, which will pick up where GILDED left off in a brand new adventure. It’s set to release September 23, 2014!